1. Headbox : Two sets of open headbox, corresponding to top layer, bottom layer, and by controlling the gas pressure in the headbox to control and stabilize the sizing of the pulp. 2. Forming section : Double layer include top layer and bottom layer, The main components are consist of breast roll, forming board, dewatering board, vacuum box, composite roll, suction couch roll, wire drive roll, wire guiding roll and paper machine framework. Top layer and bottom layer are all equipped with one forming wire respectively . 3. Press section: including First press, second press.The first press is K-type composite press with vacuum suction roll, which also equipped with one rubber coated metal roller, one vacuum press roll and one stone roll. The second press is MG press with upper & lower rubber coated metal rolls and upper & lower felts. 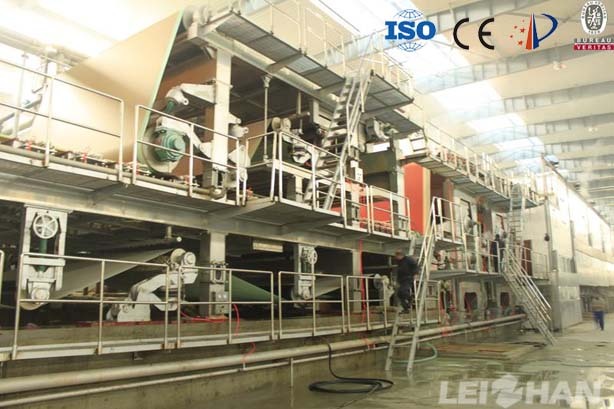 The two press are all equipped with wire guiding roll and felt suction box. These two press are pressurized by the hydraulic cylinder pressure. 4. Front drying section: Φ1500/Φ1800 dryer, drove in group and equipped with wire guiding roll, dry wire and closed gas hood. 5. Oblique surface sizing machine: one surface chrome-plated metal roller and one rubber coated metal roll. it is pressurized by corrugated gas tire pressure. 6. Back drying section: Φ1500/Φ1800 dryer drove by group and equipped with wire guiding roll, dry wire and closed gas hood. 7. Calender section: Double roller calender, the upper and lower rollers are metal rollers, pressurized way is the corrugated gas tire pressure. 8. Reel section: Pneumatic horizontal reel and pressurized way is cylinder pressure.